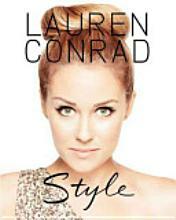 I'm really exited about the book written by Lauren Conrad. I haven't bought it yet but certainly will. I am a big fan of Lauren Conrad mostly because of 'The Hills'. But her style inspirates me very much. You've seen Lauren Conrad on TV and red carpets, looking fabulous whether she's going casual for a day with friends or dressed for a night out. Now Lauren reveals how you can adapt her classic, understated style for yourself. In her first-ever style guide, Lauren offers tips on how to create your own unique look, shares her favorite sources of inspiration, and identifies the absolute must-haves for any fashionista's wardrobe. Along the way, she examines her fashion evolution, from California-casual teen to camera-ready style icon and clothing designer. From beauty advice and hair secrets to how to shop vintage or find the perfect T-shirt, Lauren Conrad Style unlocks the mysteries of being effortlessly chic. With Lauren's guidance, you'll look and feel stylish every day.